A day in Bodghaya where Shakyamuni Buddha attained enlightenment 2,600 years ago. The opening of an exhibition in Berlin. – Nothing could be further apart. And yet, next to the stark contrast between interior and exterior there are also overlaps. 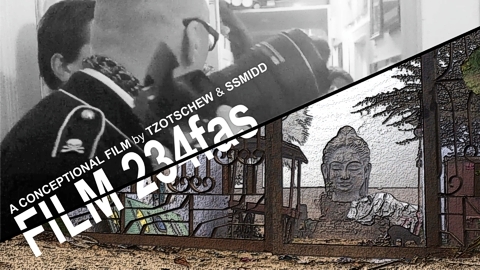 In FILM 234fas [2012|21min] artists ssmidd and Mirko Tzotschew examine the question: If and how could a film function as a cascade of two experimental films? After the double premiere “Paralleluniverse in b/w” in 2008, this is the first joint film of the two artists. October 18th, 2012 – 10 p.m. This entry was posted in Exhibition, Screening by greypost. Bookmark the permalink.